My wife and I love sitting together in our small flower garden as we sip our morning coffee. Our ever vigilant gnome, continuously on guard, looks on in approval. In the garden, Cheryl and I plan our day, discuss current events, or just breath in the fresh air. It is one of our favorite parts of the day. What is interesting is that we have found that we enjoy all of our gardens more since building the sitting garden. For us, having a small flower garden that we both find equally enjoyable has heightened our enjoyment of our other gardens. Finding the time to maintain them seems much easier. Designing small gardens are always challenging. You can really incorporate a lot of imagination into small spaces. Multi-level planters, unique designs and color themes are fun to think about. Making the most of a space is worth the effort. The best thing is that a planter only has to please you. If you like it that is all that counts. 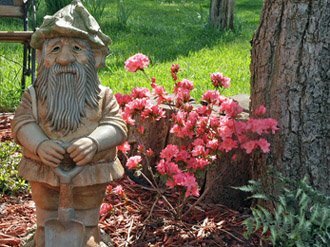 Below are a few garden themes you may want to consider when designing a small garden. Since the cost of flowers can add up quickly, choosing plants carefully is a necessity. Would you like to use only locally native plants? There are many businesses that specialize in wild flowers and local species. Is your goal to attract butterflies and native bees? 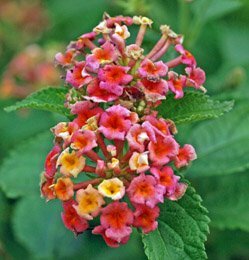 You may want to look for plants that bloom all summer long like the Lantana Confetti. Something also to consider: native plants tend to attract native bees, such as the mason bees, leafcutter bees, etc. Introduced plants that are native to Europe tend to attract honeybees, since honeybees were introduced from Europe to the U.S. There is some cross over, however. Do you want a lot of color? Color is not only in the blooms, many plants have very bright and colorful foliage. Will your garden be in full sun, partial sun, or shade? Planting the right plants for the environment will save you a lot of frustrations. Have you considered low maintenance, drought tolerant plants? There are many that are very beautiful. How about planting something unique? For example, you might consider the "Chocolate Daisy"? Every morning the air is filled with the wonderful smell of chocolate. 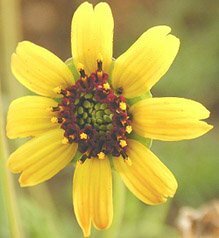 That last example about the chocolate daisy flower reminds me of when I lived on the island of Ohau, Hawaii. I lived across the street from the Wonder Bread factory. Every morning the air was filled with the smell of freshly baked bread. Now, that was wonderful! However, God has adorned nature with its own splendor and smells. I must say, the smell of chocolate in the air emanating from the chocolate daisy is hard to beat. You don't necessarily need a large garden to enjoy your flowers, unless that's your thing. For many of us, the available space can only accomidate a small planter. Good things do come in small packages, too. These pages will give you some planting ideas for your small flower garden. This is a new section with specific flower ideas on the way! Keep checking back. Lantana Confetti is a fast growing plant that puts out thousands of tiny flowers from spring to the first hard frost. Check to see what this flower is all about. Bleeding Hearts are unique and beautiful flower. Find out what makes this plant so lovable. Flaming Torch Lilies are strikingly beautiful. The flowers and stalks look like flaming arrows. My flaming torches are over 15 years old. See for yourself how wonderful these plants are. Yucca plants are thought to be desert only plants. This is not true. Yucca grow from the tropics to Canada. Find out how to care for these beautiful blooming plants. There is an art to designing a beautiful container. Fortunately, it is very easy. Matching color schemes is just one idea that can make a beautiful eye-catching container. This section on Flower Gardens is a new section for Lawn Care Academy, so the specific flower and ideas pages are being written. Please stay tuned! The Absolutely Amazing AgriGro Biostimulants for Beautiful, Healthy Plants.